Entering Monday night’s game, the Pitt men’s basketball team had not lost a home opener since 1996. Kevin Stallings was also the coach during that loss — but for the Panthers’ opponent, Illinois State. This time, Stallings experienced the defeat from the other side. The Panthers (0-2) committed 19 turnovers in a back-and-forth, 83-78 overtime loss to Montana (2-0) with a record-low crowd watching from the stands. Only 3,102 fans sat in the Petersen Events Center Monday, the arena’s all-time worst announced attendance for a regular season game, continuing a trend of decreasing attendance at the Pete. For the Grizzlies, the victory marked their first over a Power Five team since 2010. First-year center Terrell Brown opened up the game with a layup on the Panthers’ first possession to secure a 2-0 lead. However, Pitt’s offense looked sloppy after that, with four quick turnovers in the first five minutes. The Grizzlies used Pitt’s offensive miscommunications to their advantage, scoring eight of their first 15 points off Panther turnovers. Turnovers plagued Pitt’s offense for the remainder of the half, and no player was immune — each starter coughed the ball up at least once by the half’s end. First year Shamiel Stevenson gave the Panthers some much-needed momentum when he earned an and one on a strong drive to the hoop. On the next possession he attacked the basket again, knocking down one of two free throws to tie the game at 17 apiece. Stevenson continued his rhythm, scoring a layup on the next possession for his fifth straight point to give the Panthers a 19-17 lead. Ryan Luther then drained a three and extended the Panthers’ lead to five points. The offensive explosion prompted a time-out and a clipboard throw from Montana coach Travis DeCuire. After working the offense and extending the lead to seven, the Panthers’ attack stalled. Montana redshirt junior Ahmaad Rorie took advantage of Pitt’s lull and knocked down back-to-back 3-pointers to make the score 28-27. He would finish the night with 18 points. Pitt’s inability to defend the 3-point shot allowed Montana to take a 33-32 lead after hitting treys on four straight possessions. Rorie and junior Bobby Moorehead mounted the deep-range attack, hitting two apiece. After conceding two more layups to junior Michael Oguine, the Panthers ended the first half trailing 37-35. Oguine led all Montana players with 13 points, while junior Jared Wilson-Frame led the Panthers with 11 points after the first frame. First-year guard Khameron Davis opened up the second half with his second 3-pointer of the contest, giving Pitt a 38-37 lead. However, multiple turnovers caused the Panthers to fall behind 43-39 with 17 minutes remaining. Pitt finished the game with 19 turnovers, which resulted in 30 Montana points. While the Panther defense continued to allow baskets, Wilson-Frame did all he could to keep the team in the game. Over the next five minutes, he scored the only four points for the team while Montana took a 48-43 lead. The back-and-forth momentum picked up with the Panthers going down 51-47, only to go on a 7-0 run spurred by five quick points from redshirt senior guard Jonathan Milligan. Those were his only points of the night, but Milligan was a notable presence for the Panthers on defense, as he constantly harassed the opposing team’s ball-handler. The Panthers appeared poised to take over after Davis drew a charge. Instead, they committed back-to-back turnovers, leading to two breakaway dunks and giving Montana a 61-60 lead. Oguine continued to plague the Panthers, hitting consecutive threes with two minutes remaining. Oguine then found himself at the free throw line with the game tied. He drained both shots to give Montana a 73-71 lead. The Montana backcourt led the team in scoring — Oguine finished with 29 points and Rorie finished with 18. Stevenson tied the game with 27 seconds left when he cut to the basket for a layup, and after no final scoring success the teams went into overtime at 73-73. Stevenson finished as Pitt’s leading scorer with 19 points. The five minute overtime period started in Montana’s favor when Rorie scored with a jumper. Luther’s senior leadership was on full display, though, as he scored Pitt’s first four points to answer the Grizzlies. Trailing 79-77 with 49 seconds left, Stevenson earned a trip to the free throw line with the opportunity to tie the game. He made the first but missed the second, allowing Montana to maintain a one-point lead. 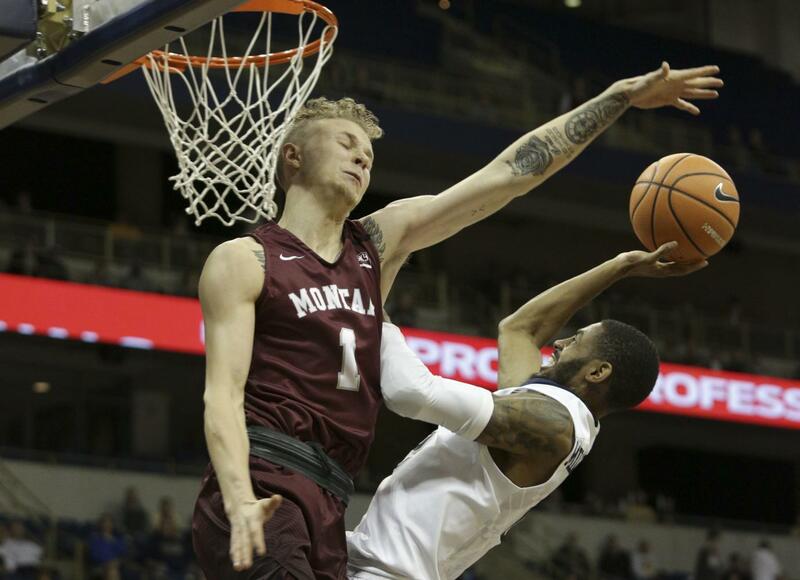 After a missed Pitt shot, Montana made its ensuing free throws to secure an 83-78 victory. The Panthers return to the Petersen Events Center Wednesday night for a 7 p.m. game against the University of California, Santa Barbara.